WORK IN PROGRESS....... Need new pedals, new 3 screens, and the new computer. Any chance you’d be willing to show your connection method from the button box to the frame (far right)? I have a similar setup (p1 frame with 3 button boxes). Is that box interfering with your up shifts (I have a Fanatec shifter as well and never found a good spot due to this). Any chance you’d be will to show your connection method from the button box to the frame (far right)? I have a similar setup (p1 frame with 3 button boxes). Is that box interfering with your up shifts (I have a Fanatec shifter as well and never found a good spot due to this). Thanks for the details! Much appreciated! I was wondering if you just bent a bracket. I’m thinking I may just add an adjustable swivel joint so I can play with the angle. As for pedals. I went through a pair of modified g27’s then thrustmaster pros, then fanatec v3 (with both the brake mod and 2 dampers), then tried HE pros shortly then HE ultimates for a good bit of time. I settled for HPP’s which I still highly recommend after an embarrassing amount of hours of use. Here is a decent pic of mine and then some lousy pics of the install. If you want my take on the different pedals send me a message. Thanks for the details! Much appreciated! I was wondering if you just bent a bracket. I’m think I may just add a adjustable swivel joint so I can play with the angle. As for pedals. I went through a pair of modified g27’s then thrustmaster pros, then fanatec v3 (with and with both the brake mod and 2 dampers), then tried HE pros shortly then HE ultimates for a good bit of time. I settled for HPP’s which I still highly recommend after an embarrassing amount of hours of use. Here is a decent pic of mine and then some lousy pics of the install. If you want my take on the different pedals send me a message. I forgot to mention... I did bent two brackets just a little in order to get wanted angle. As for the pedals, I think I would be happy with the HE Ultimates but who knows? By the way, what made you switch from ultimates to hpp's? Hey Nathan, could you give us some impressions where the differences between the 3 pedals are? The HE pros were fine, the brake was a step up from the Fanatec’s I had. I tried these for a short time on a motion rig. But both the ultimates and the pros had too little brake travel for me which made modulation and trail braking difficult. For the ultimates I literally took off my shoes after 10 minutes of use because the travel was so short and intense - in order to feel the small amounts of travel I needed to be in my socks. Keep in mind I was wearing my actual driving shoes. On the ultimates we switched out to the weakest dampers which are still very strong and re-did dxview and I was surprised to see just how few steps there were relative to the clutch/accelerator pedal (literally less than half, close to 1/3). In general I just felt like the brake did not feel like any car/race-car I’ve been in - the Pros felt like a kart to me (I’ve done shifter karts, formula dodge and ended in a 996 cup car for a short time in real life). Regardless, small travel, lots of pressure and then lock. The ultimates are better in my opinion because of the damper making it feel less like a load cell behind synthetic dampers and more like a hydraulic system. The ultimates were certainly a big jump up from the fanatec v3’s I had but they weren’t right for me. My last two “complaints” are minor, the weight of the units is silly. The clutch pedal is not special and doesn’t feel like a clutch. Overall the units are pretty, and you can see a lot of care goes into producing them. I think they are great units. I like the company as well. - brake feel is most similar to race cars I’ve been in and love the initial movement and then bite (like in a real car where the piston moves reasonably easy until the pad hits the rotor). This can be removed but I prefer it. Does require adding a small deadzone via dxview. - easy to mount, due to weight only two bolts to hold down each pedal, makes moving/sliding them easy and mounting options are simple. - lots of springs options (low medium strong and two secondary springs for the clutch plate). 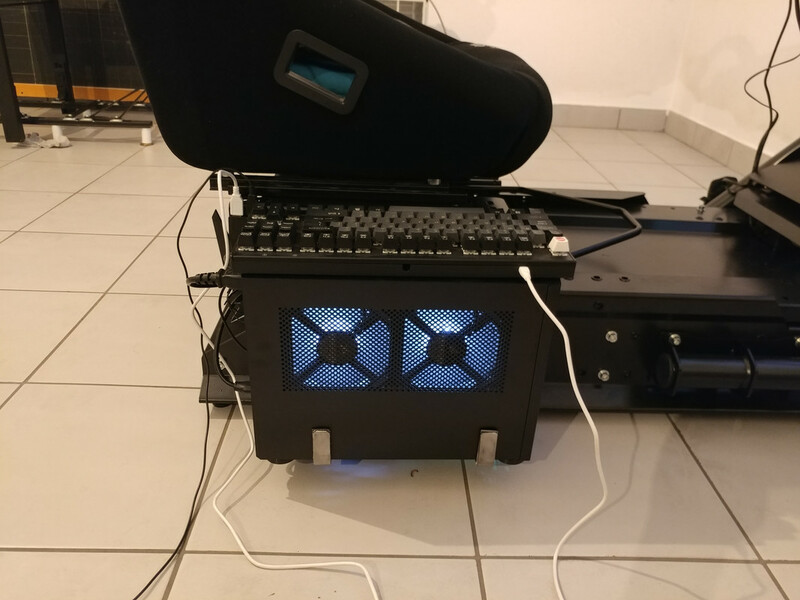 - great response from owner (always responded within 48 hours and gave me good technical info and PDFs etc so I could prepare my rig before they arrived. I’ve heard some complain about his response time. I literally emailed him 6-8 times and I don’t recall a single time he didn’t respond by the following day. So I’m not denying others experience, can only say mine was easy before,during and after buying. - cost, it’s inline with direct competitors but still it’s expensive. - lead time for getting unit, I waited 2 months but was told this up front. These are mine before installing and adding a 3rd soft brake damper. I’m silly and take pictures of stuff before install. Thanks Nathan for your answer, that was a great read. My youngest son's setup, with my T300. But what will I use in the closet then??.. . Just figured out how to connect both the Fanatec CSL E LC Pedals and a TH8A shifter to the Drive Hub! According to your experience with the Ultimates, It has been brought to my attention that Ultimates are exactly what I would like. Super stiff and exaggerated heavy units. Personal preference of course and whether the pedals feel like a real racing car or not, it doesn't matter to me. I just love the feeling of stiff and heavy racing items for some reason. Anything that feels light and easy is not my cup of tea. Once again, great info and thanks! The clutch pedal is not special and doesn’t feel like a clutch. The clutch is simply better, that’s hard to debate. Interesting read. I think it does come to personal preference. I remember Barry saying the HE ULT clutch was the best he ever felt in sim race pedals. Did you find the HPP clutch better, or did I misread ? I have used my HE Pro's for about 18 months now and I am very happy with the throttle and brake pedal. The clutch works fine too, but does not feel like I would like it to. I got to try the Ultimate clutch at a friends rig and I must say I agree with Barry here. I love they way it works and feels, a step up compared to the Pro's. As my Audi R8 LMS carbon wheel will be ready soon,i work on Audi R8 LMS dashboard for SimHUB. -Pit Stop blink screen when car is in pitlane. -This version don't have rpm leds.Can use to lcd screens with external rpm leds.I will release version with leds soon. 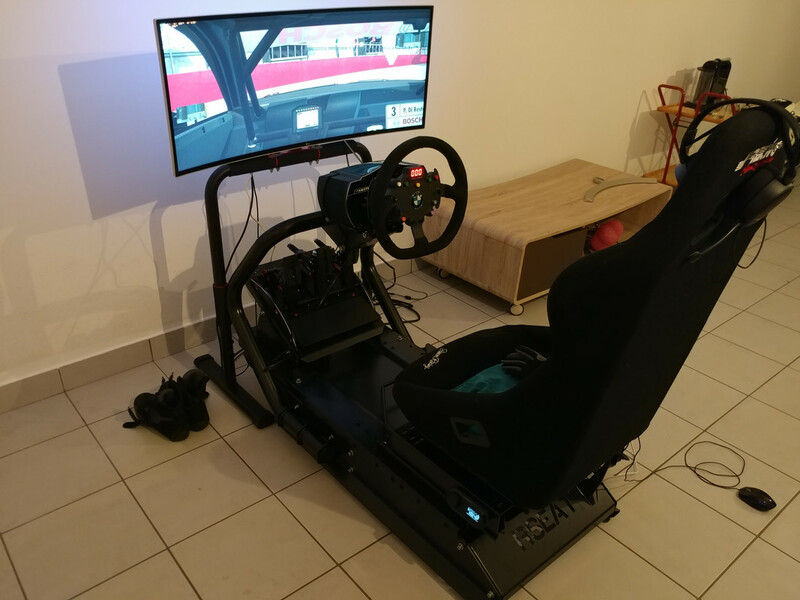 My new setup: RSEAT S1, with Simoni Racing seat.